After the run, Calvin Monnett and Mason Walter (son of WBD VP of Strategic Communications Lance Walter) beam for the camera with WBD Senior Vice President & Senior Loan Officer Jason Monnett. 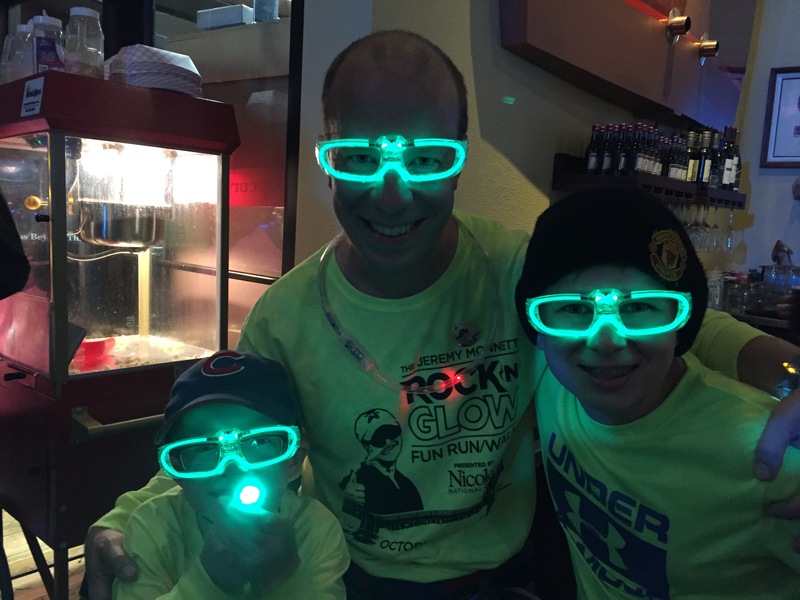 It may have been a Friday the thirteenth, but organizers of the Jeremy Monnett Rock ‘n’ Glow Fun Run/Walk lucked out with a big band of brightly beaming participants who helped honor the memory of WBD’s twin brother, Jeremy Monnett. Held at the Dockside Tavern/Oshkosh Riverwalk, the family event drew more than 500 people, who dressed brightly and lit themselves with anything from glow sticks, to glowing glasses, to glow paint as they ran in either the Sadoff E-recycling & Data Destruction 2K Walk or the Strang, Patteson, Renning, Lewis, & Lacy 5K Run/Walk. Participants who chose to “glow-stick around” were treated to a performance by Kitty Corona—which purred through music from the “80s and Elsewhere”—during the “After Glow” event. Money raised from this year’s event, sponsored by Bank First National, will be used to match contributions to the Oshkosh Area Community Foundation to fund grief counseling and other services for children who have lost close family members. Additional proceeds will be contributed the Jeremy Monnett and Mike Clark scholarship funds. ← How Do We C.R.E.A.T.E. Our Core Values?